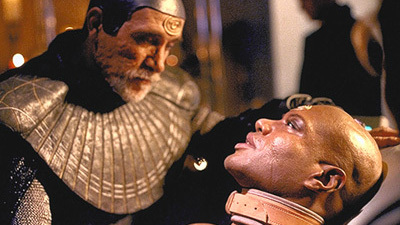 Although SG-1 has rescued Teal'c's body, his mind remains loyal to Apophis. Having been revived from death in the sarcophagus, Teal'c has returned to the belief that he is once again Apophis's First Prime. SG-1 must take drastic action to free his mind from the hold of the Goa'uld, and Bra'tac demands the Rite of M'al Sharran. The risky and ancient ritual, similar to a Last Rite, would save Teal'c's soul by taking him to the very threshold of death, and as his memories wash over him, he would be forced to remember, and to choose his true path. Teal'c's symbiote is removed, and his immune system begins to fail, bringing him ever closer to death. As his friends remain by his bedside, Teal'c begins to relive his life's journey. He recalls his days in training on Chulak as an apprentice under Master Bra'tac and a member of Apophis's personal guard. He remembers his friend, Va'lar, whom he was ordered to kill for failure in battle, but whom he set free, only to later burn his village under orders from Apophis. He relives his indecision as his mentor spoke of false gods, even as he became Bra'tac's successor and rose to First Prime. As Teal'c reaches the moment of death, his memories return him to the dungeon on Chulak, and his first encounter with SG-1. There he had seen a strength, and had tasted a first hope for freedom. He had taken to heart his master's teachings of false gods, and had put his faith in Jack O'Neill. This memory is the turning point. In that instant, the flood of memories returns, and once again Teal'c rediscovers his true path. He chooses freedom. The Rite of M'al Sharran is successful, and Teal'c's mind and body are restored as a member of SG-1. The power of the sarcophagus forced Teal'c to once again believe that he was loyal to Apophis. The Rite of M'al Sharran, similar to a Last Rite, would save his soul by taking him to the very threshold of death, and as his memories wash over him, he is forced to remember, and choose his true path. Bra'tac has tried it twice before, but both times failed and resulted in death. Va'lar and Teal'c were friends, both were Jaffa in training under Bra'tac when he was First Prime, and served together in Apophis's personal guard. Va'lar was ordered killed for failure in battle against Ra, but was freed by Teal'c and banished, then later killed when Teal'c burned his village under orders from Apophis. Teal'c became Bra'tac's apprentice and trained as his successor, learning his beliefs of false gods until turning against Apophis and joining the Tauri. Ronac was Teal'c's father and First Prime of Cronus. He was murdered for failing to win an unwinable battle, and his family was exiled to Chulak. Bra'tac is 137 years old. His symbiote will mature in two years, and will be his last. A new symbiote would reject a host of that age. It is how old warriors die.